Within days of Saudi Arabia’s blockade of Qatar, there were media reports that the Chairman of Saudi Media City was stating that a new channel would be launched which would provide an alternative to beIN. The new channel was to be called “PBS Sports”, and social media posts began encouraging people to “follow us on frequency 11977 on Arabsat”. Other prominent Saudi figures, such as Saud Al-Qahtani, an advisor to the Saudi Royal Court who was fired from his position for his role in the abduction and murder of Jamal Khashoggi, tweeted to his followers that an alternative to beIN SPORTS would be available “very soon”. Al-Qahtani’s efforts did not end there — he called on his now infamous troll army (Al-Qahtani has 1.3m+ followers) to spread misinformation and negative sentiments about beIN. PBS Sports was never launched. However, in August 2017, beoutQ officially launched with a massive social media campaign, and began its mass-scale piracy operation. 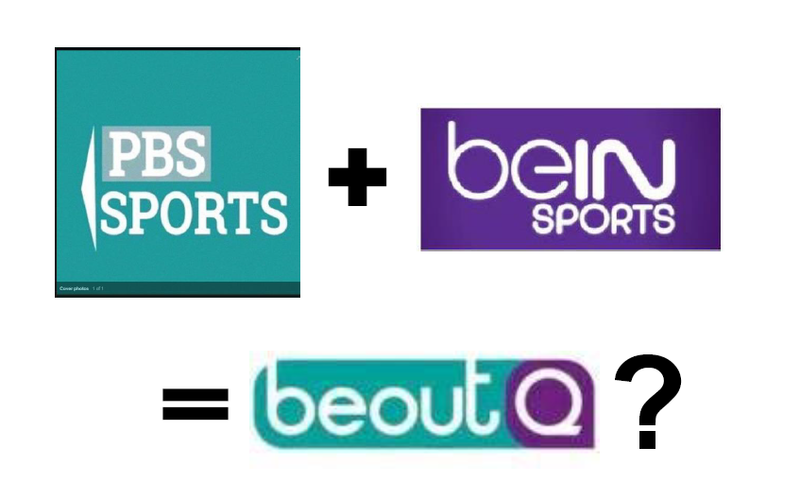 The beoutQ logo looks like a merger of the PBS Sports logo and beIN’s own logo. 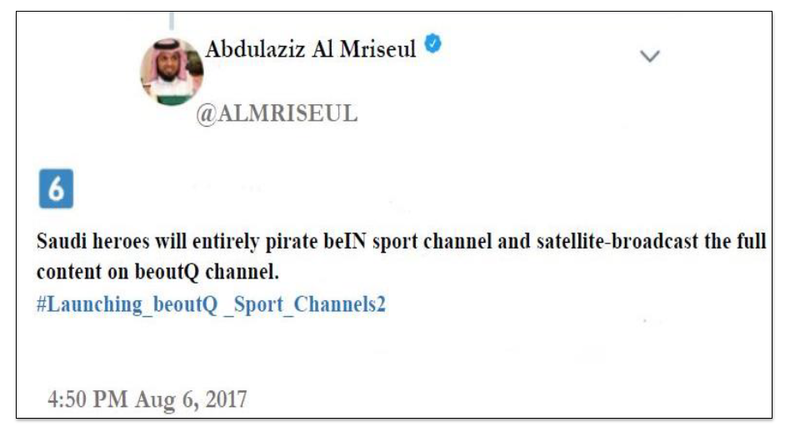 Another prominent Saudi figure, Abdulaziz Al Mriseul, Director of Al Riyadi newspaper, began promoting beoutQ through a series of tweets from his personal account, with one in August 2017 flagrantly stating that “Saudi heroes” will pirate beIN and broadcast the full content on beoutQ. Since then, Al Mriseul, along with a growing number of Saudi media personalities and public figures, have tweeted a variety of propaganda ranging from mass misinformation campaigns to competitions awarding those who mock beIN SPORTS with free beoutQ boxes. Yet astonishingly, the propaganda and manipulation of truth didn’t stop there. During advertisement breaks of the most watched sports content in the world, anti-Qatar and anti-beIN propaganda commercials are being broadcast to beoutQ viewers under the hypocritical tagline of “No to politicizing sports”. These adverts range from animated videos mocking beIN and rights owners like FIFA, UEFA and the English Premier League for their failure to disrupt beoutQ’s mass piracy of their content, to politically-fueled and false accusations of alleged Qatari support for terrorist groups. Thanks to evidence that emerged in June 2018 during the FIFA World Cup, it is now known that this piracy plague is far from an independent operation. Supported and endorsed by the Government of Saudi Arabia, beoutQ has been broadcast in public platforms across Saudi Arabia including open screenings in parks, squares, and other community arenas like Riyadh’s International Convention and Exhibition Center. Social media, along with prominent international journalists, have unequivocally revealed that beoutQ has the full backing of the Saudi government, ironically exposing the shady innerworkings of the Kingdom’s attempt to 'depoliticize sports'.